Bitrix24 presents several tools for business communication which let you stay in contact with your colleagues and stay updated about ongoing work and system events. All messages sent via the above-mentioned tools are saved in the intranet, indexed for search, and available at any point in the future for reference. 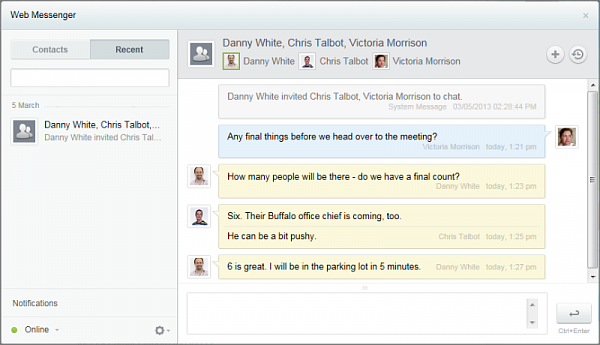 The internal messenger delivers system messages and instant messages from user to user. Aside from the usual one-to-one chat, you can invite multiple colleagues to chat sessions and discussion immediate issues in a convenient way. 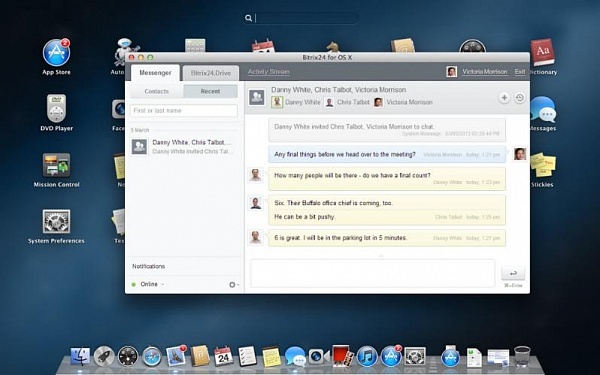 Group chat is available in the Web Messenger as well as in the Desktop App and mobile apps (participation only, no initiating group chats from the mobile). If a topic is long and involved, it may be more convenient to use the voice and video calling feature. Bitrix24's video chat is an excellent replacement of external voice and video services. 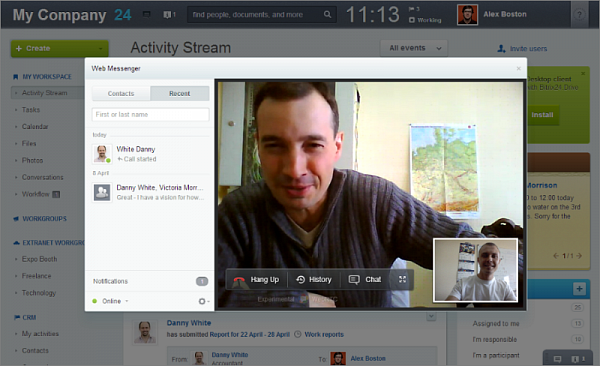 To start a video chat, you simply open the Web Messenger and choose the user to call. All communications are performed through your browser (support presently for Chrome 26.0 and higher) – there are no plugins or add-ons. 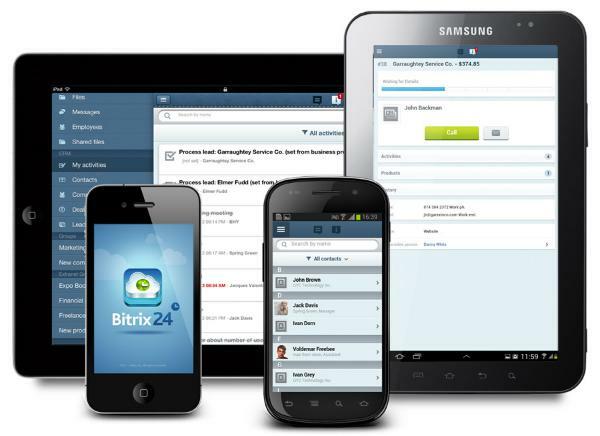 Using the free Mobile App, you can access your social intranet and collaborate with colleagues from anywhere! New messages and notifications are pushed to you even when the application is closed. Furthermore, you can also view contact details of your co-workers, read news in your Activity Stream, manage files, schedule events, monitor tasks, post comment and 'like' things that are being discussed, as well as work with the CRM. Downloaded it now in the Apple App Store and on the Google Play Market. 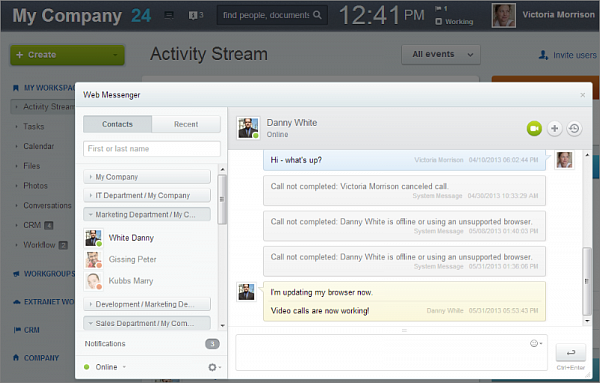 With the Free Desktop App, you can close your browser and still stay in touch through the company intranet. You will still get personal messages and notifications of the most important new developments, likes, comments, and changes in tasks in the Activity Stream. The Desktop app also features Bitrix24.Drive which provides you with a powerful tool to manage and synch your documents and files between your Mac / PC and your Bitrix24. Download it now for your Mac or Windows.